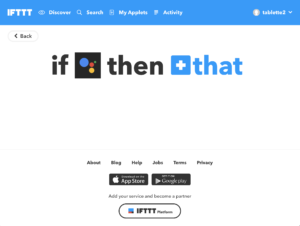 The IFTTT service, is an iPhone / Android / English website application that allows you to trigger actions according to certain conditions on a very large number of events, products or internet services. The MyOmBox API is a piece of computer code on your MyOmBox, which will allow companies and third-party services (subject to authorization), to launch actions on your MyOmBox (for example launch a scenario). The purpose of this article is to explain how to configure the IFTTT application for Google Home to launch the commands on your MyOmBox. 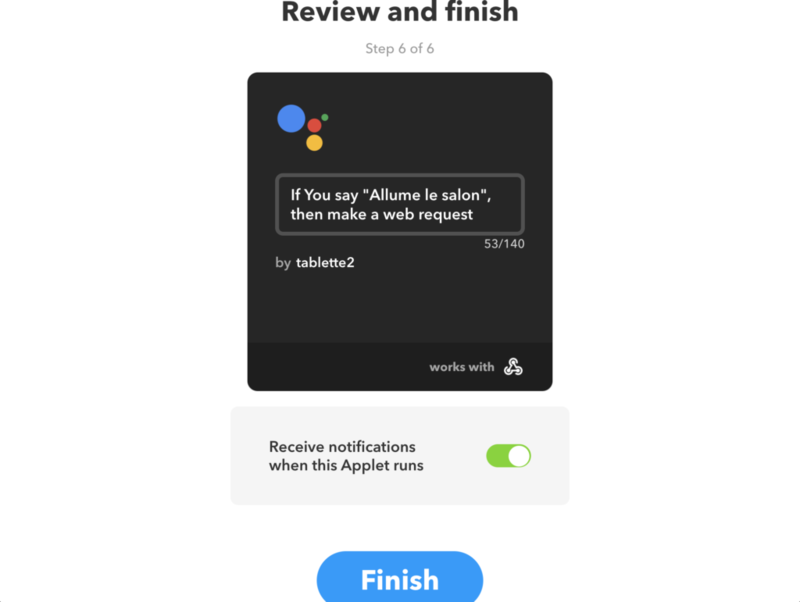 It is possible to do this from your smartphone but we advise you to do it from your computer because the few copy / paste to achieve will be easier while following this tutorial. 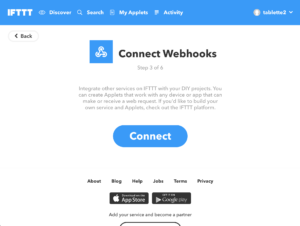 Image 1 – Go to https://ifttt.com/ from your internet browser. Image 1 – We advise you to use the links “Continue with Google” or “Continue with Facebook” which will enable you to register more quickly. You can otherwise click on the “Sign Up” link to register. 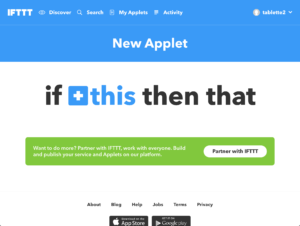 Image 2 – Once registered and on the IFTTT home page, you must then click on the “New Applet” link at the top right to create a new condition to trigger an event. 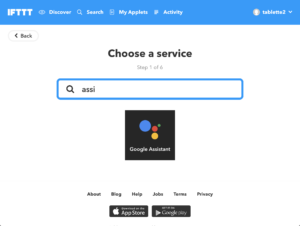 4 – Here we will do a search and select the Google Assistant. 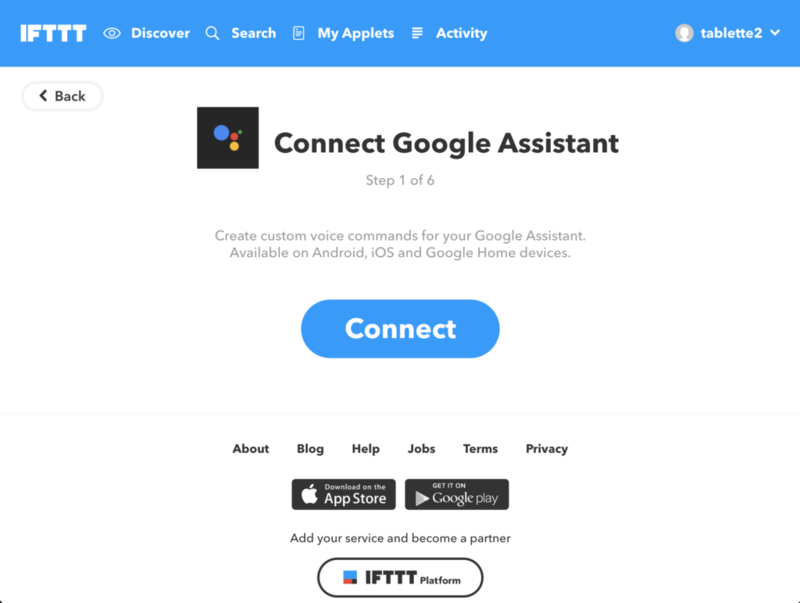 5 – You must then click on the “Connect” button to allow the IFTTT service to communicate with your Google Assistant. Follow the steps by re-entering your ID and Google password. 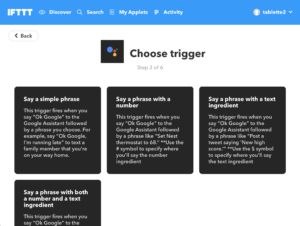 6 – Once this step realized you will be able to click on the block “Say a simple phrase” in order to be able to enter the trigger element (your sentence)! 7 – You can then enter 3 different declensions of sentence that will allow you to trigger the event. The last 2 elements of the form at the bottom of the page are for the answer that Google Assistant will make to your request. Indicate what you need. 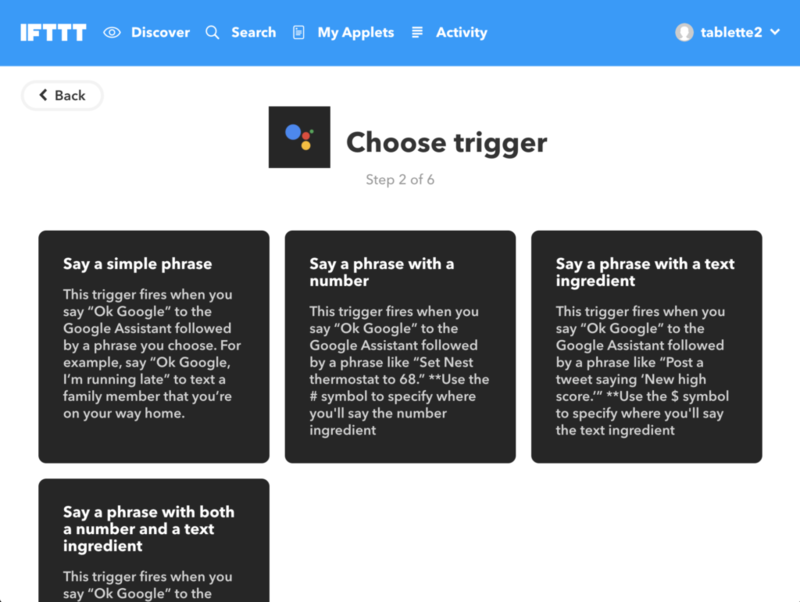 Finally, click on the “Create trigger” button at the bottom to complete this first step. 8 – Now that the trigger is set, it will be necessary to configure the action to perform. 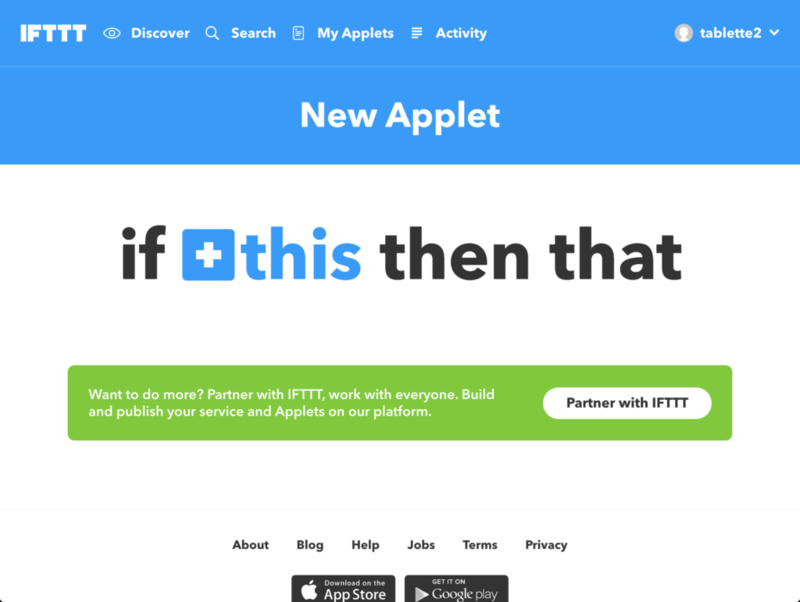 You have to click on “+ that” to start. 9 – Then look for the block called “Webhooks” and click on it. 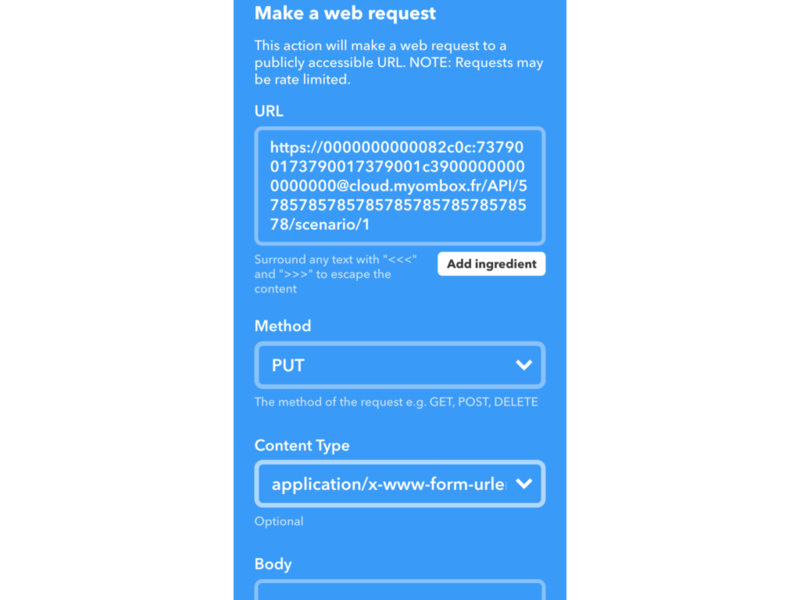 11 – Then click on the block “Make a web request” to go to the setting step. The elements in bold are to be kept as they are, the elements in italics are to be replaced by the good values! 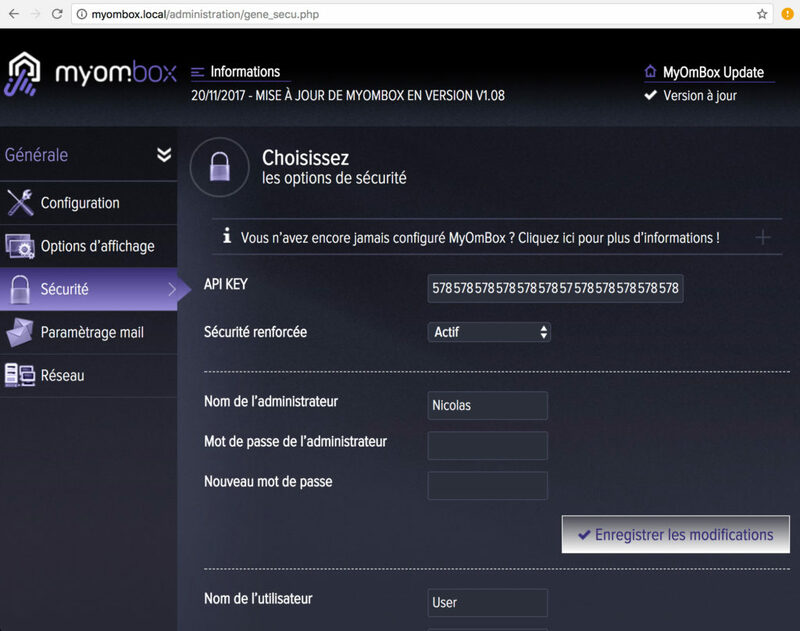 <myombox_url> = it’s the unique address that allows you to access on your MyOmBox from outside. 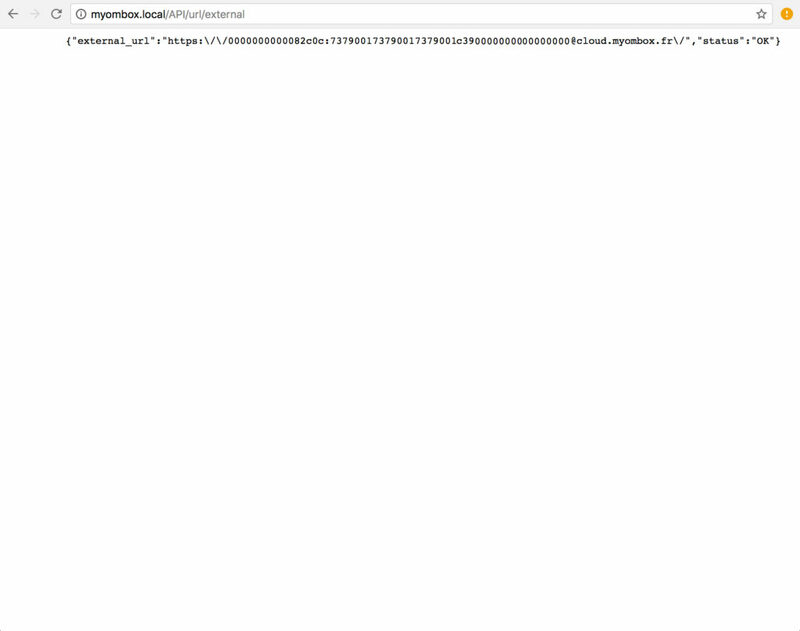 Either via your dynDns address or via your MyOmBox cloud address (detailed below). 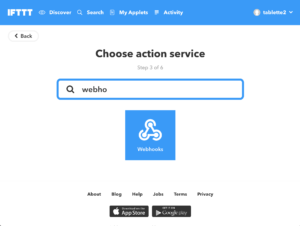 <API_key> = this is the secret key used by your MyOmBox that will allow you to launch an action automatically from the outside. <light_id> = this is the myHome address of your living room light in this example that you can recover from MyOmBox administration. <status> = it is the action on the light that you wish to achieve, here “on” or “off”. 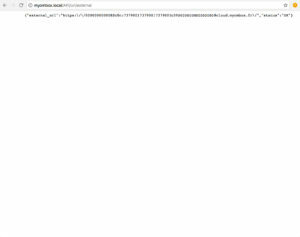 • 12 – <myombox_url> : If you have a dyndns or noip address you can directly use it without forgetting to put the redirection port (ex : http://home.dyndns.org:8080/ ). 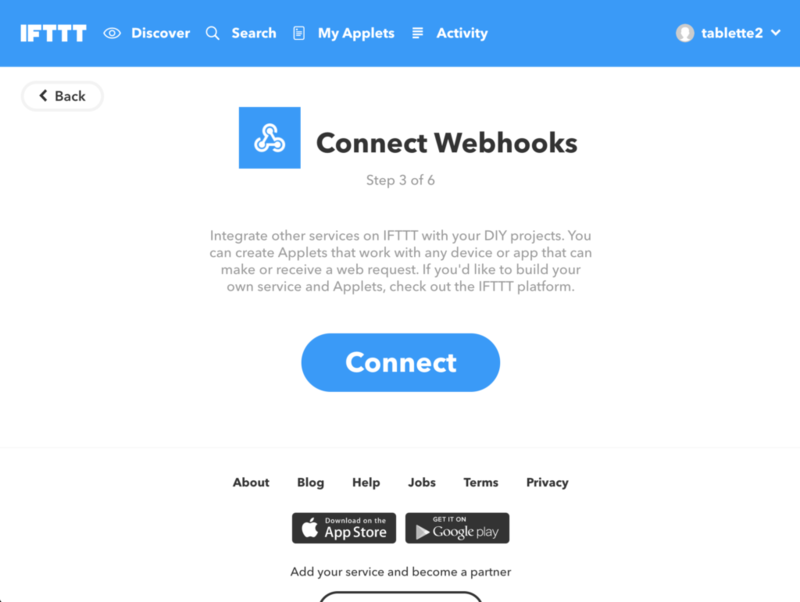 If you do not have dyndns or if you want to use our automatic cloud system, you must retrieve your external connection address directly from your MyOmBox (or from the settings of your IOS / Android application). 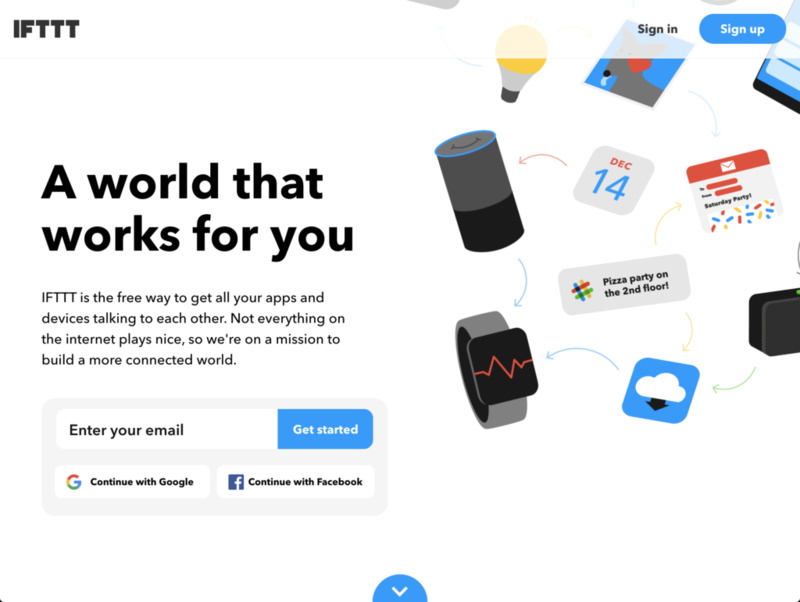 As you can see in picture 12 you have to enter following your MyOmBox address in your browser: /API/url/external (ex for MAC: http://myombox.local/API/url/external – ex for windows: http://192.168.x.x/API/url/external). 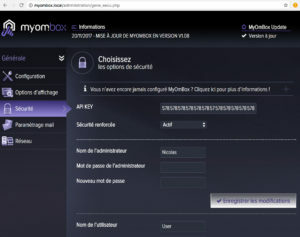 You must then copy and paste the address that starts with “https:\/\/” and ends with “myombox.com \ /“. Then delete the 3 characters “\” in this address. 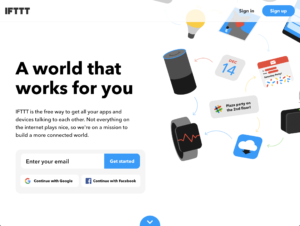 If you copy the obtained address “https://000…..@cloud.myombox.com/” into another window of your internet browser, you should be able to access the interface of your MyOmBox. 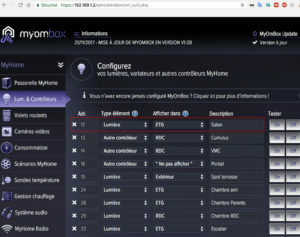 • 13 – <API_key> : To retrieve the unique API key to your MyOmBox, you must go to the administration of your MyOmBox, “General” tab then “Security” and copy the character string “API KEY”. 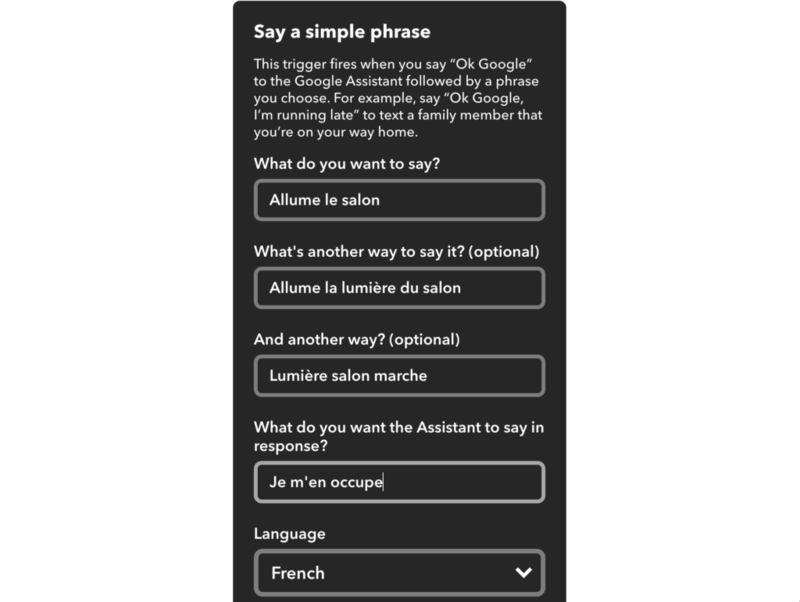 • 14 – <light_id> : We get the BUS light address in MyOmBox administration, tab “MyHome” then “Light & Controllers”, here the12 for the living room (Salon in French). 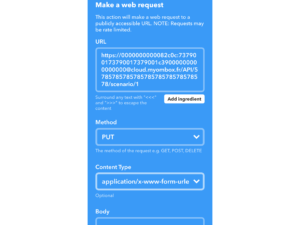 • 15 – In “Method” you have to select “PUT” and in “Content Type” you have to put “application / x-www-form-url …”. “Body” must be left blank. 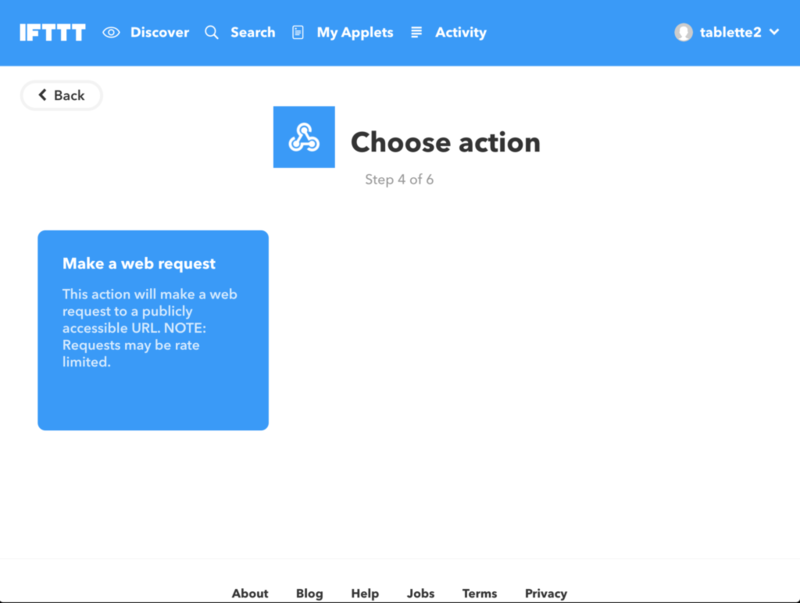 Then you can click on “Create action” to save the action. • 16 – All you have to do is click on “Finish” to activate this first voice command. To test if it works, it may be necessary to wait 1 or 2 minutes. 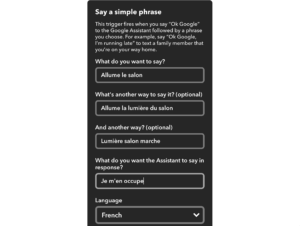 Then you just say “ok Google”, followed by the command you entered in step 7. If that does not work try to read again the article and check that you have not forgotten any character or letter in the address. 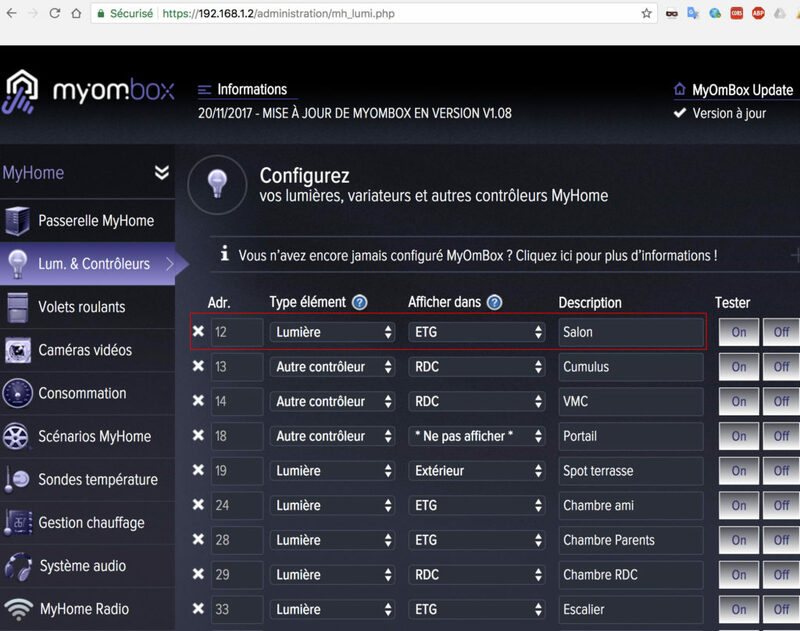 For now only the triggering of MyOmBox scenarios, the simple management of lights and electric roller shutters in MyHome Bus and MyHome Play are available. More official documentation will be available in mid 2018 with all the features of MyOmBox. <myombox_url> = it’s the unique address that allows you to access on your MyOmBox from outside. 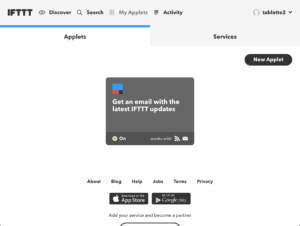 Either via your dynDns address or via your MyOmBox cloud address. The <group_id> can be found on MyOmBox administration in edit mode of a group. The group ID appears at the end of the URL: “… crea_group_lumi.php?act=modif&idgr=3″ in this example the group id is 3.